Koni Yellows + TMS H&R springs here. Decent setup for street use, not low enough for my aesthetic taste though. 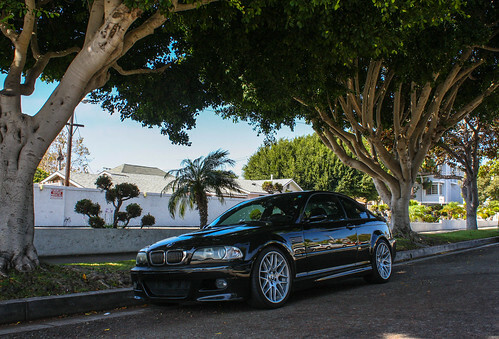 Also the problem with springs is the E46 M3 has this uneven balance from factory where the driver side is higher to "compensate for driver weight" not a fan looks stupid and the only way to remedy this is with coilovers. ... and then end up with the same look, once you corner balance. Last edited by Cha5en; Tue, Dec-19-2017 at 05:38:29 PM. Tires should be part of this discussion. I put the Eibach Pro Street S on my car when it was on RE71s. I was pretty happy with it on the street, but felt that it was harsher then most described in the review. Put a fresh set of PSS on the car and it's exactly what I wanted. Seems obvious, but it's a reminder that any time we go back and forth over springs, shocks, etc., we should also be disclosing the type of tire we're running. Makes a big difference, and I generally forget to consider it. FWIW, the Eibachs with stock top mounts (swapped) and 265/18 PSS is a great street setup for my tastes. I just bought another M3 with springs/shocks and the suspension feels far less locked down over bumps at freeway speeds. Yes everything except for front strut mounts..all those bump stops and rubber parts add up quickly. Thanks for suggesting that list, I even got front and rear reinforcement plates. Can someone with KONI Yellows comment if they came with new rubber boots or not? Every set of pics I've seen indicates no.... worth replacing if they are original? They do not, I didn't bother replacing mine or the bump stops. Both were in decent condition. Thanks for the quick reply! How many miles are on your car (if they are original)? In hindsight, one "mistake" I made was not replacing the rubber shims (upper and lower pads). Thought I could get away with it, but they creak a bit. Just recently picked up the shims and will do next spring. Along with new tie rods. I think I’m going to knock out sway bar end links and tie rods down the road, along with a new sway bar kit - should be a nice secondary wave of refreshing while upgrading. All times are GMT. The time now is 04:32:41 PM.